THIS LEASE, made and entered into this _____ day of __________, by and between ______________________, hereinafter referred to as "Landlord," and __________________, hereinafter referred to as "Tenant." 2. PRESENT CONDITION OF PROPERTY. Tenant has examined, and accepts the building, improvements, and any fixtures on the premises, in present condition, subject to the construction of Tenant Improvements as detailed on the plans and specifications labeled Exhibit "B," attached hereto and made a part hereof by reference. No representation, statement, or warranty, express or implied, has been made by or on behalf of Landlord as to the condition of the premises, or as to the use that may be made of the premises. In no event shall Landlord be liable for any reasonably apparent defect in the premises or for any limitation on the use of the premises not within the Landlord's control. 3.1 Initial Term. The term of this lease shall commence at 12:00 noon on ________, 19__ (the "Commencement Date"), and unless terminated as herein provided for, shall end at 12:00 noon on the ______ day of ______, 20__. The Commencement Date as set forth in this Paragraph 3.1 shall be subject to those adjustments of the Commencement Date, if any, set forth in Paragraph 3.3 which relate to the performance of construction on the premises. 3.2 Tenant Improvement Construction. 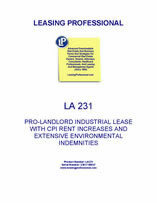 The Commencement Date of this lease shall be delayed until the substantial completion of the tenant improvements described on Exhibit "B" attached hereto and delivery of possession to Tenant, if such occurs after the Commencement Date, as follows: If for any reason Landlord does not substantially complete such construction prior to the Commencement Date, such failure will not affect the validity of this lease, but in such case Tenant shall not be obligated to pay rent until such construction is substantially completed and possession of the premises is delivered to Tenant. Provided, however, if Landlord shall not have substantially completed and delivered possession of the premises within sixty (60) days after the Commencement Date, Tenant may, at Tenant's option, upon notice in writing to Landlord delivered within ten (10) days after the end of the 60-day period, cancel this lease. Landlord shall have no liability to Tenant for failure to substantially complete construction prior to any date or dates. Tenant's only remedy shall be cancellation of the lease. Should construction of the tenant improvements be completed to such an extent as to permit the issuance of a partial certificate of occupancy by the governing authority, Tenant may but shall not be required to occupy the portion of the premises so permitted prior to (or after) the Commencement Date and shall pay rent for the occupied portion, prorated in proportion to the number of square feet of building space occupied, beginning on date of delivery of possession. Rent adjustments shall be similarly prorated. In no event shall Tenant take possession prior to satisfaction of the requirements for Tenant's insurance set forth below. 3.3 Delivery of Possession. Except as above provided with respect to construction of Tenant Improvements, Tenant shall be entitled to possession of the premises at noon on the Commencement Date, as defined in Paragraph 3.1. Tenant may, with approval by Landlord in its sole discretion, have access to the premises during tenant improvement construction for the purpose of moving in Tenant-owned furniture, fixtures, equipment and inventory. This access and the items so moved in shall not in any way impede the construction of the tenant improvements, nor shall Landlord, its agent, employees, sub-contractors, or any other person on the premises whether invited or not invited, be liable for the protection, care or security of Tenant owned items. This paragraph shall not be construed so as to permit Tenant to occupy the premises prior to the satisfaction of all requirements for Tenant's insurance set forth below. 4.2.2 Notwithstanding the foregoing, the parties agree that the increase in base rental for each year shall be not less than three percent (3%) nor more than eight percent (8%) of the base rental for the previous year, each year for such purposes to commence on the anniversary of the Commencement Date. 4.3 Maintenance Expense for Grounds, Snow Removal, Exterior and HVAC. Tenant shall pay its pro rata share based on the square footage occupied of the cost of having Landlord maintain the HVAC systems and the exterior of the premises including parking lots, green areas, sidewalks, entrances, and corridors (but not the exterior surfaces of the building, other than glass). Cost of maintaining such areas shall include, but shall not be limited to, repairs, preventative maintenance, HVAC filters and compressors, sealing, striping, lawn mowing, snow removal (Tenant is responsible for snow removal of less than 2"), gardening, shrub care and replacements, lawn watering, parking area maintenance, electricity for lighting, sign maintenance, depreciation of equipment used for the foregoing purposes and other costs related to the premises or common areas specifically excluding any capital expenditures excepting HVAC. Landlord shall perform such maintenance and charge the cost thereof to Tenant, which shall be paid as additional rent within 30 days after delivery of Landlord's invoice. Landlord shall keep reasonable records of such cost, which shall be available for Tenant's inspection during normal business hours. Certain items of such maintenance (such as landscape maintenance and snow removal) are performed by Landlord on numerous areas owned and/or maintained by Landlord, in addition to the premises, and the cost thereof cannot be precisely ascribed to the premises. As to such services which are performed on areas in addition to the premises, the cost for all areas so serviced shall be allocated to the premises in proportion to the square feet of building floor space in the premises compared to the square feet of building floor space in the entire area to which such services are provided. For the first year of the lease, Landlord agrees that the total of the maintenance fees referred to in this paragraph will not exceed $0.95 per square foot annually. Such expenses shall not increase more than an average annual rate of eight percent during the term of the lease.